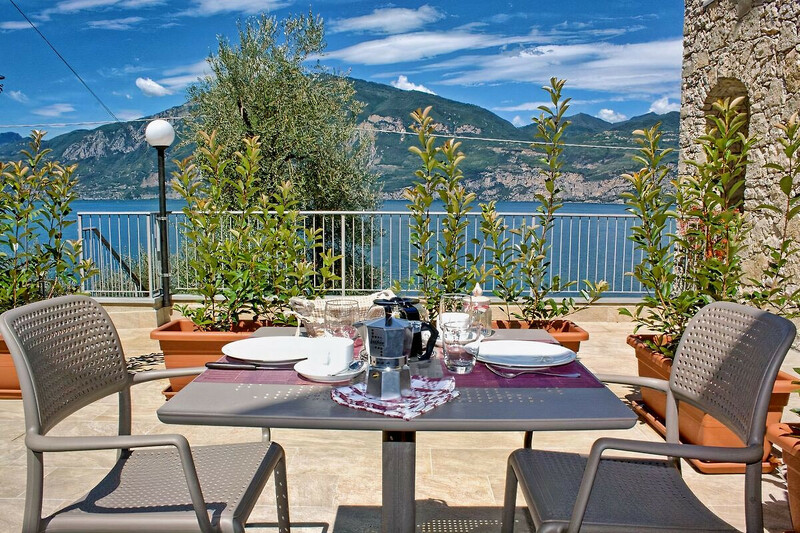 The Villa Alessia is located on a quiet parallel road just above Lake Garda. 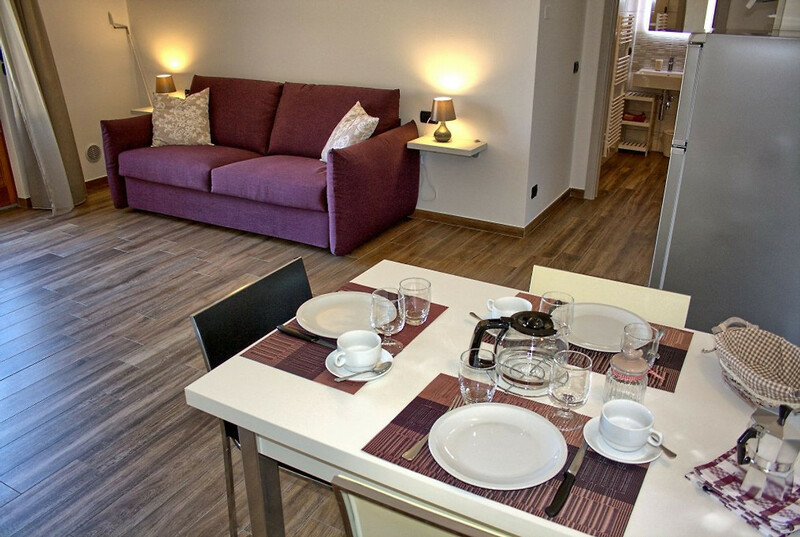 The studio is very modern furnished and has a large, furnished terrace, from where you can enjoy a wonderful view of the lake. 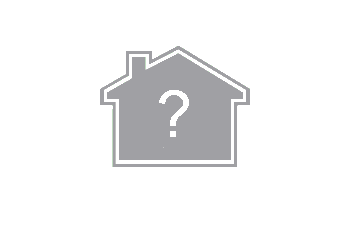 An occupancy of two persons with a small child is also possible. As an additional sleeping possibility, a seat convertible to the bed is provided. 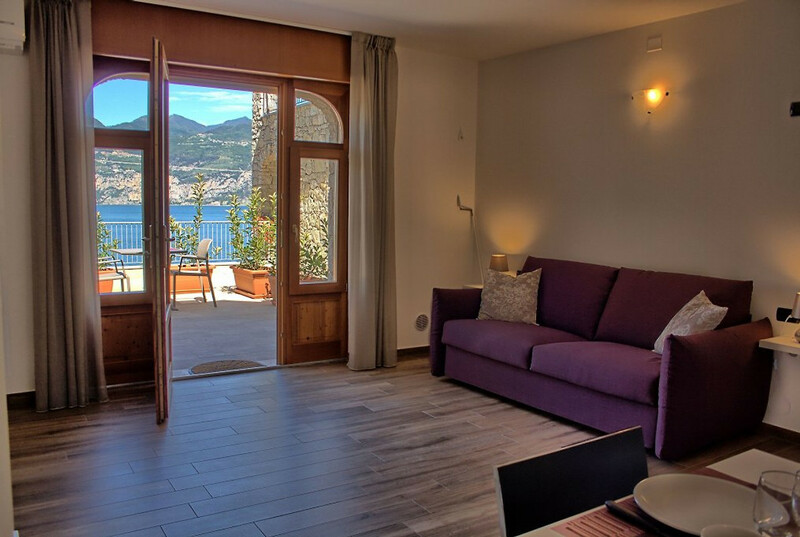 Opened in spring 2017, the holiday house Villa Alessia offers a total of 3 apartments. Adjacent to the studio (the terrace is separated by planted flowerpots from the entrance of the other apartment) is still a large apartment up to 7 people. 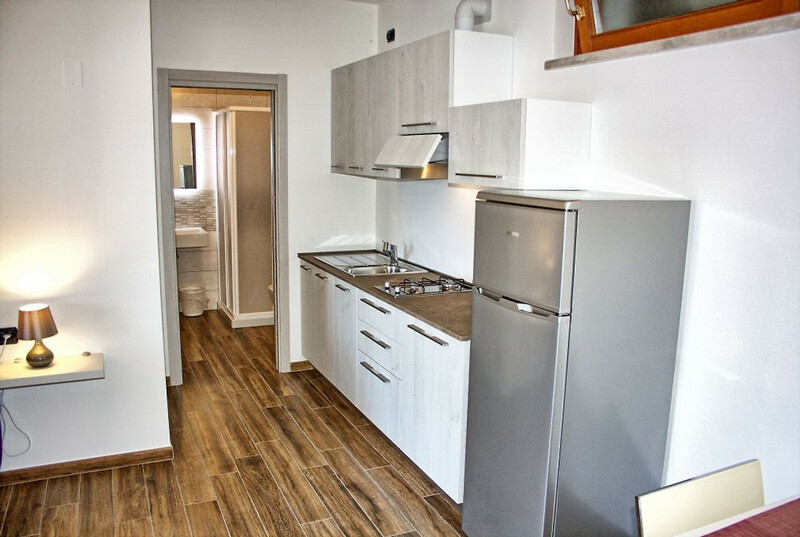 The studio can also be rented in combination with the adjoining apartment (Listing: 102395) and thus offers accommodation for up to 10 people. 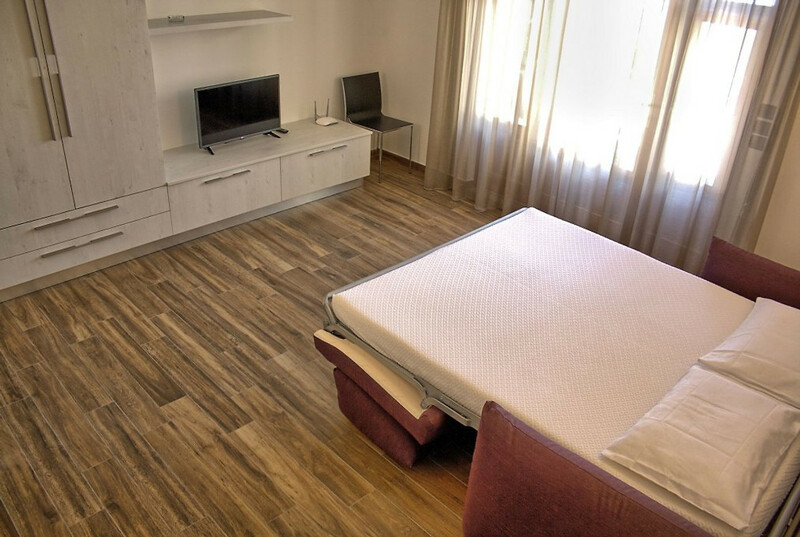 The studio has a spacious living room with a very good sofa bed, table and chairs, SAT-TV, 2-door wardrobe and a fully equipped modern kitchen corner with gas stove (2 plates), water cooker, toaster, large refrigerator with ice compartment and German coffee machine. 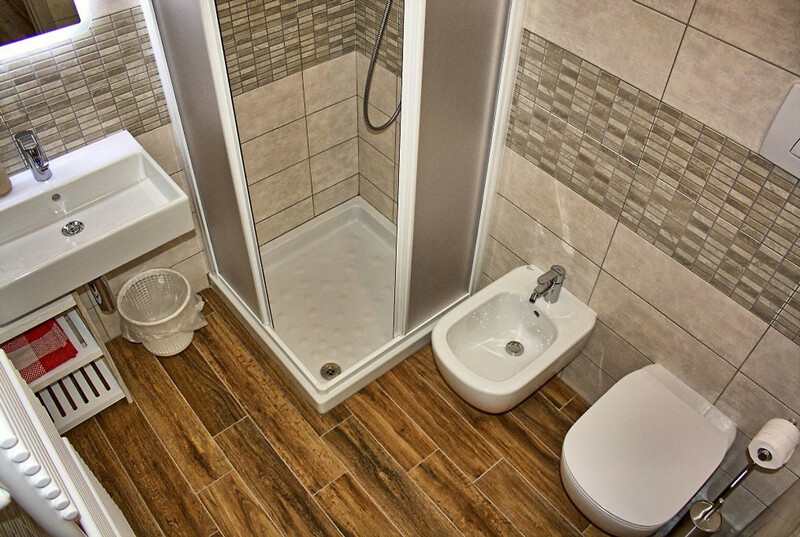 Furthermore, the studio is equipped with a small, modern bathroom with shower, bidet and WC. 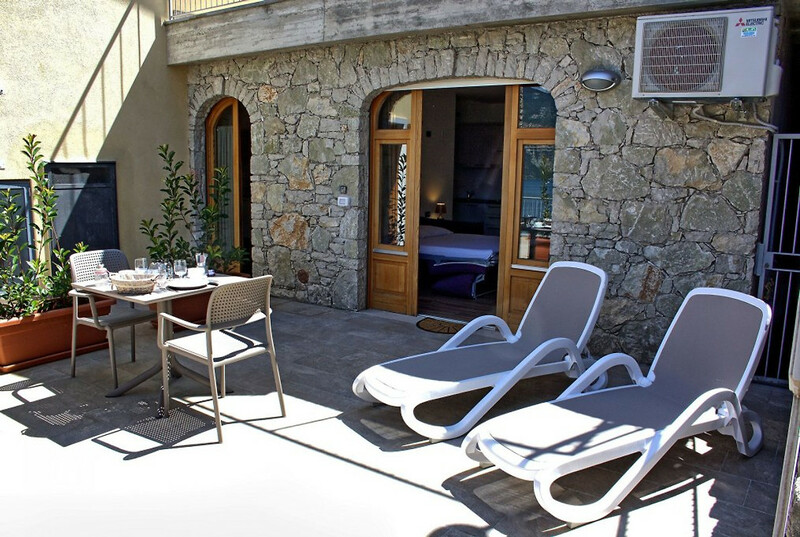 In addition to the interior of about 29sqm, the studio also offers a large terrace (about 15sqm), which is equipped with table, chairs, umbrella and 2 sunbaths. 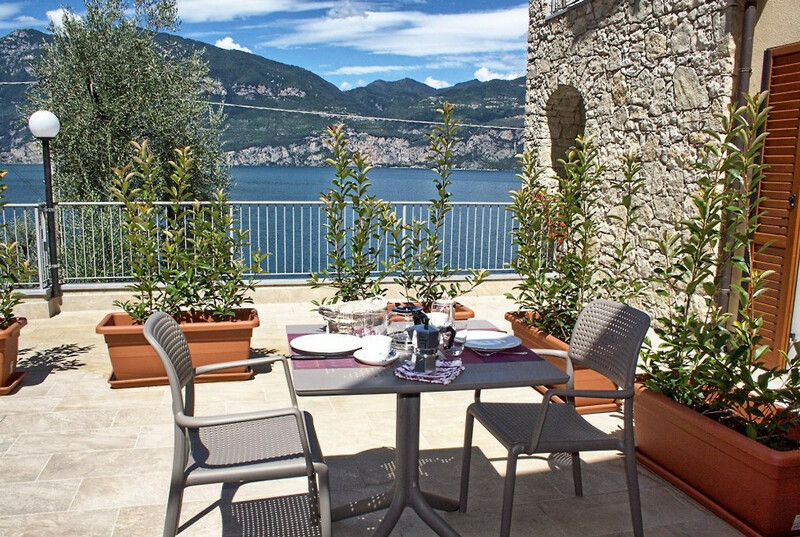 From this terrace you can enjoy a wonderful view of the lake just a few meters away. The studio is equipped with blinds and is therefore also cool in warm temperatures. For an additional fee (EUR / day) an air conditioning system can be booked. 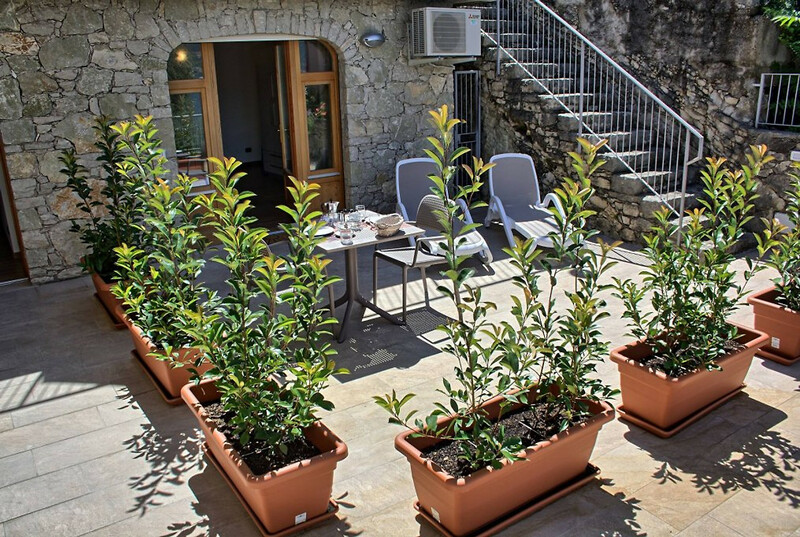 The holiday home Villa Alessia is located in the small, very characteristic, unspoiled village of Marniga in the increasingly popular community of Brenzone on the north-eastern shores of Lake Garda. Not far from the popular but also very crowded places Malcesine (about 10 km north) and Torri del Benaco (about 12 km south), are mainly nature fans, recreation-seeking families and lovers of the Italian culture and way of life, the An accommodation away from the mass tourism and off the hustle and bustle, be thrilled by this place. 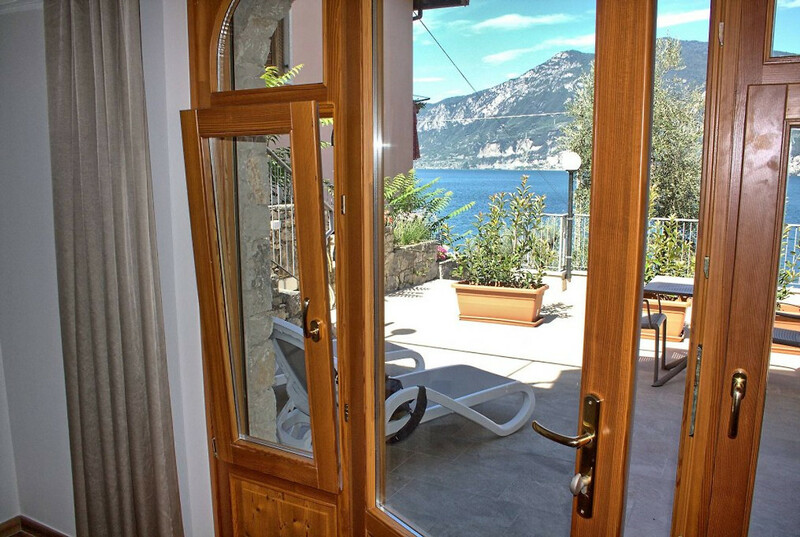 Situated on a quiet side street just above the waterfront, the holiday house offers you a central yet quiet location, where you can enjoy a fantastic unobstructed view of Lake Garda just a few meters away. The municipality of Brenzone has 16 small charming villages, with a total population of about 2520 people. One place surpasses others with incomparable charm and original Italian flair. From small, lively villages along the riverbank, with picturesque ports, bars and restaurants, to historic villages in the hinterland, to alpine huts and quiet mountain villages at 1500m to 2000m altitude, Brenzone offers more than a variety of natural, relaxed and adventurous Vacation. The beach and promenade are only 400m away. Along the promenade there are several small beach sections with the usual coarse pebbles on Lake Garda and the crystal-clear turquoise water of the lake with the best water quality. The nearest restaurant, very popular also with locals, can be found in about 250m distance. The Ristorante & Pizzeria Belvedere is known not only for the excellent simple but high quality cuisine, but also for its good service and value for money. In the adjoining village Magugnano (about 1km-reachable via the promenade), there are other good, recommended restaurants. Along the beautiful promenade you will find bars and a very good ice cream parlor next to the picturesque harbor. But also in the southern direction, in the probably most famous and romantic place of Brenzone, the dreamy Castelletto, which can also be reached with a pleasant walk along the promenade in less than 2km, there is a wide choice of dining options. Whether on the picturesque harbor or in the characteristic old town on cozy spots, everyone will find here his favorite restaurant. Along the lakeside promenade, there are many cozy bars in the village of Brenzone, right by the lake, where the sunset can be enjoyed with a glass of local wine or a sparkling aperitif. The small villages of the municipality of Brenzone offer only a few shops with beach utensils, as well as a lot of traditional grocery stores, in addition to some supermarkets with daily fresh bread rolls (a large CONAD supermarket is only 850 meters away). In addition to a traditional fishmonger and a butcher shop, there is also a classic "pasticceria" with Italian pastry and a bottega where, besides the local olive oil, there are also other typical products from the region to try and buy. The larger villages such as Malcesine or Torri del Benaco are ideal for shopping in small boutiques. Those wishing to leave their own car in the garage can easily get to know the surrounding area by taking a public bus. The nearest bus stop is just 350 meters away on the Uferstraße. The settlements on the opposite shore can be reached best and most comfortable by ship. The nearest ship dock is in Magugnano (1km). 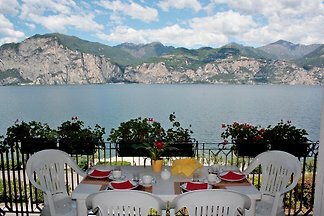 Organized tours with stays on the southern lake are offered from Malcesine. Also culturally, Lake Garda and its surroundings offer endless possibilities. There is a wide range of activities available in the picturesque villages along the lake or in the big cities in the area. Even Verona or Venice can be easily reached by public bus from Marniga. For questions about the excursion possibilities we are at your disposal. This price includes the cost of Cleaning, gas, water, internet, electricity, laundry package, Garage / Parking, washing machine and baby bed . Wireless connection, parking in the open garage and communal use of the washing machine. In only 10 km north you will find Malcesine, probably one of the most famous places on the northern side of Lake Garda. In addition to its romantic old town with many small streets and romantic squares, Malcesine is very well known for its landmark, the Skaligerburg. No less famous is the state-of-the-art cable car, which will take you to Monte Baldo within 10 minutes with the latest technology up to an altitude of 1760m (Tratto Spino). Malcesine can be reached via the lake promenade. Marniga is the ideal starting point for hiking in the enchanting hinterland. Here, from cozy walks in the hinterland or along the lake in a dreamlike environment to hikes of all levels of difficulty for everyone something suitable. In the municipality of Brenzone the first Nordic Walking Park of Lake Garda was recently opened. On site, you are welcome to submit your material. Whether you are looking for cozy cycling tours along the lakeside promenade or adventurous mountain bike tours to the untouched hinterland, unforgettable impressions and great views are guaranteed. About us, your landlord, you can rent comfortable city bikes from EUR per person per day, in order to discover the dreamlike environment at the same time in a comfortable and sporty way. The bikes are taken directly to the accommodation. It is not for nothing that the town sign of the municipality of Brenzone with the inscription "Paradiso della vela e del kite / sailing and kitesurfing parades" is advertised for no reason. In the immediate vicinity of your holiday home are several water sports schools. Because of the immediate proximity (about 400m) we can recommend you as an excellent starting point the surfing and sailing school GARDASURF. If you want to try your hand at sailing, surfing, kite surfing, or simply enjoy the stunning nature around you, the Gardasurf team is the right place for you. In addition to a long-standing tradition and a wide range of water sports facilities in just one hand, the Gardasurf team as VDWS and VDS member also offers the necessary quality. From beginners, advanced to professional - everyone is welcome here. For the first attempts on the board or boat are also offered taster courses. If you want to do a little leisure activity near the water, you can relax while fishing on the shores of Lake Garda. For this, a fishing permit is required for holidaymakers, which can be obtained at the municipal administration or in the post office. After many years of experience with the rental of our Villa Bruna (listing: 63807) in Cassone, we have now opened an alternative with larger apartments in our new Villa Alessia. 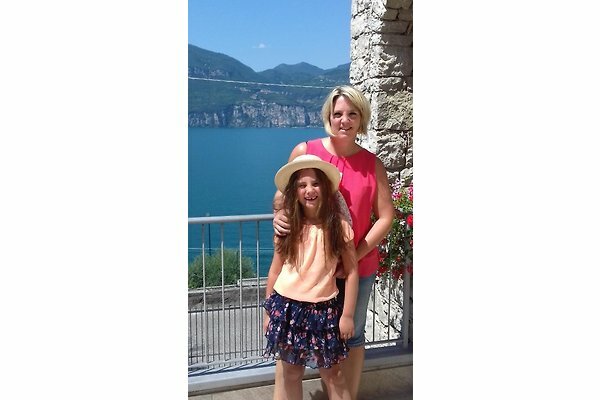 We would like to take care of you, Andrea with daughter Alessia and the entire family Cressotti, that you can spend here on the Lake Garda an unforgettable holiday in a dreamlike environment. Wir waren eine Woche im wunderschönen Studio. Die Ausstattung ist geschmackvoll, sehr gut und es ist alles da, was man benötigt. Alles war blitzsauber. Keine Lebensmittelreste der Vorgänger, wie z. B. Zucker oder Salz o. ä. in den Schränken, was ich persönlich äußerst löblich finde. 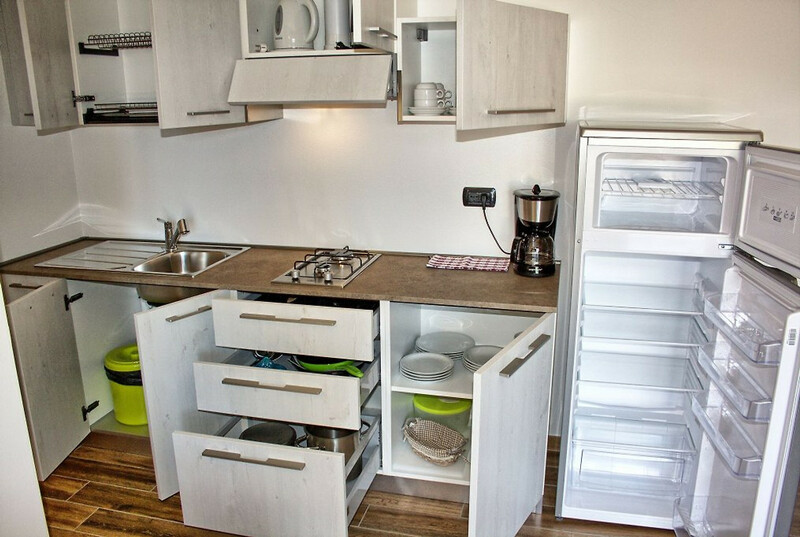 Es gibt einen großen Kühlschrank mit Tiefkühlfach! Den grandiosen Seeblick nicht zu vergessen! Nachts war es sehr ruhig. Das Auto steht schattig in der großen offenen Garage, wo man ggf. auch Räder abstellen kann. Diese sind über Frau Sackmann auch preisgünstig und kurzfristig zu mieten. Man ist in minutenschnelle am See (5 Min) und im Supermarkt/Bäcker (gut 10 Min) zum Brötchen holen. In drei Minuten Entfernung gibt es ein gutes Restaurant wo man leckere Pizza, hausgemachte Pasta, Fisch oder andere Spezialitäten zu moderatem Preis essen kann. Frau Sackmann kümmert sich freundlich und fürsorglich um ihre Gäste, gibt bei der Ankunft viele Informationen anhand, darüber hinaus noch den ein oder anderen Tipp und ist immer gut zu erreichen. Alles hat geklappt wie am Schnürchen. Wir werden sicher nicht das letzte Mal in diesem idyllischen Örtchen und in der Villa Alessia gewesen sein. Es freut mich, dass Sie nicht bereut haben, Ihren Urlaub dieses Mal an der Olivenriviera und in der schönen charakteristischen Gemeinde Brenzone verbracht zu haben. Ein großen Dankeschön dafür, dass die Wahl auf unsere Villa Alessia gefallen ist. Einen schönen Gruß auch an Ihren Mann. 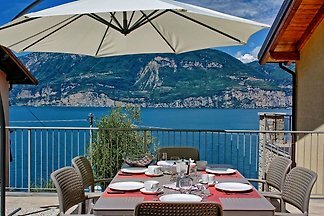 Die Suche nach einer Ferienwohnung am Gardasee war mit der Villa Alessia (Studio für 2 Personen) ein Volltreffer: An-und Abreise auch unter der Woche möglich, Sauberkeit, Ruhe etc. - alles Top und selbst wenn technische Geräte kaputt gehen, ist man sehr schnell um Hilfe bemüht. Die Homepage gibt schon sehr gute Einblicke und durch die sehr freundliche Vermieterin Andrea Sackmann erfährt man viele weitere Details zu Land, Leute und kulturellen Möglichkeiten. Sehr empfehlenswert ist dabei eine organisierte Busfahrt nach Venedig. 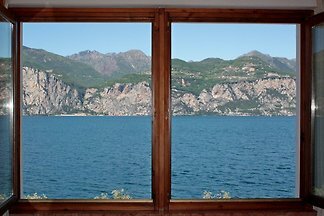 Danke für diesen Traumurlaub, mit einem malerischen Blick auf den Gardasee und Umgebung. 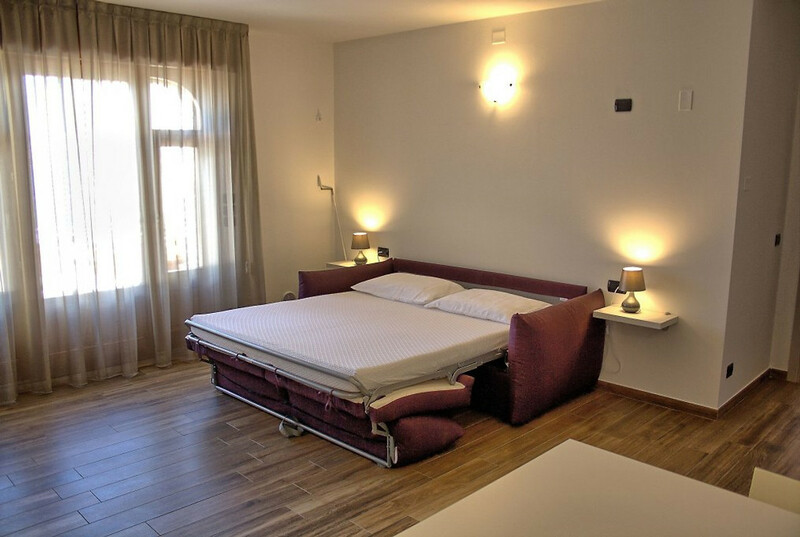 herzlichen Dank für die positiven Zeilen zu unserer Villa Alessia. Es freut mich sehr, dass es Ihnen so gut gefallen hat und Sie viele schöne Erinnerungen und neue Eindrücke mit nach Hause genommen haben. Einen schönen Gruß auch an Ihren Mann! Das Studio ist modern und gemütlich eingerichtet, alles was man benötigt,ist in bestem Zustand vorhanden. Die Lage ist toll zum relaxen, man hat einen super Ausblick von der Terrasse auf den See, der schnell zu Fuß erreichbar ist. Wir haben uns sofort wohl gefühlt. Besonders die sehr freundliche und kompetente Vermieterin, welche uns mit Infos und Tipps rund um unseren Aufenthalt versorgte, hat viel dazu beigetragen,dass wir gerne wieder kommen werden. ganz lieben Dank für die positive Bewertung. Es freut mich sehr zu hören, dass Sie und Ihr Freund sich bei uns in der Villa Alessia wohl gefühlt haben und sich vom Alltag erholen konnten. Herzlichen Dank nochmals dafür, dass Sie unsere Villa Alessia als Ihre Unterkunft ausgewählt hatten. Über ein Wiedersehen würde ich mich jederzeit sehr freuen! Wir haben 10 tolle Tage in der Villa Alessia verbracht. Das Studio entsprach in allem unseren Erwartungen. Besonders möchten wir uns bei Frau Sackmann bedanken für die super Betreuung und die vielen tollen Tipps. Rundum hat alles gepasst sogar das Wetter hat an allen Tagen mitgespielt. Wir können die Villa Alessia nur weiter empfehlen und hoffen das wir auch selbst mal wieder das Studio buchen können. Es freut mich, dass es Ihnen und Ihrer Frau bei uns in Marniga so gut gefallen hat und Sie einen schönen eindrucksvollen Aufenthalt am Gardasee verbracht haben. Ich würde mich jederzeit sehr über ein Wiedersehen freuen! Bis dahin wünsche ich Ihnen und Ihrer Frau alles Liebe! Gerade haben wir einen wunderschönen Urlaub hinter uns. Das lag zwar nicht nur am Wetter, sondern auch an der gemütlichen und gut ausgestatteten Wohnung, die wir 10 Tage unser Heim nennen durften, und vor allem an dem ausgezeichneten Service. Besonders zu betonen ist die ausgesprochene Freundlichkeit und Hilfsbereitschaft von Frau Sackmann. Jeder Wunsch wurde sofort erfüllt.Unvergessen bleiben auch die Abende auf der großen Terrasse mit dem Blick auf das andere Ufer mit den vielen Lichtern. Wir können diese Unterkunft nur wärmstens empfehlen. vielen lieben Dank für diese positiven Worte. Es freut mich sehr, dass Sie sich bei uns so wohl gefühlt haben und einen schönen erholsamen Urlaub in der Gemeinde Brenzone verbracht haben. Ich wünsche Ihnen und Ihrem Mann alles Liebe, vor allem viel Gesundheit und würde mich sehr über ein Wiedersehen freuen. Es freut uns sehr, dass es euch so gut bei uns in der Villa Alessia gefallen hat. Über so sympathische Gäste wie euch, die auch nicht so bekanntere Ecken vom Gardasee zu schätzen wissen, sind wir immer sehr glücklich. Bis bald und liebe Grüße nach Chemnitz! 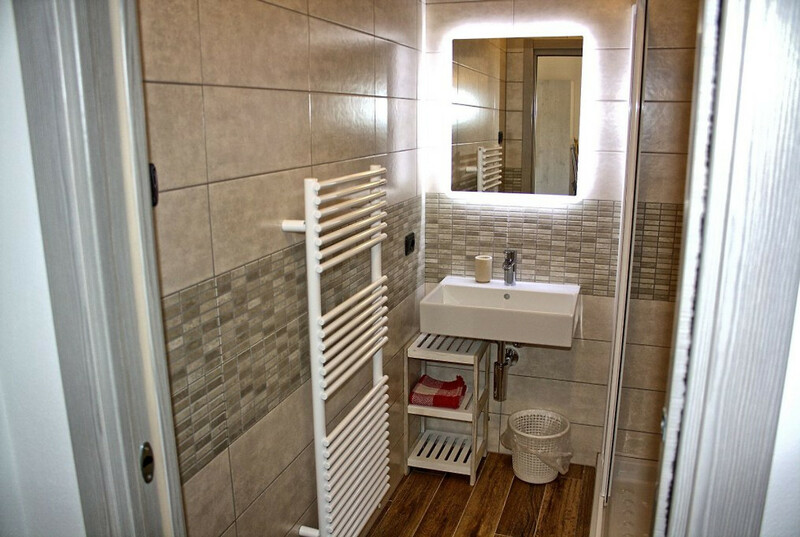 Ein sehr schön gelegenes Appartment mit sehr freundlicher deutschsprachiger Betreuung und gutem Service. Wir freuen uns auf euren nächsten Besuch in der Villa Alessia oder auch wieder in der Villa Bruna. Liebe Grüße an die ganze Familie! und wir werden uns sicherlich wiedersehen. Für uns stand Entspannung, Ruhe, angenehmes Klima sowie gute Gastronomie im Vordergrund. Kleine Wünsche zur Verbesserung der Ausstattung: Sitzbezüge für die Aussenstühle, Eierbecher und Messer (für Brotaufstrich). Es ist für uns eine Selbstverständlichkeit das App. in dem Zustand zurückzugeben, in dem Sie es vorgefunden haben. Aber schön, dass Sie es erwähnten. Verbesserungswünsche nehmen wir immer gerne an. Die meisten Sachen sind umsetzbar. Es freut uns, dass Sie einen schönen Urlaub bei uns verbracht haben. Eine super schöne Wohnung mit einem sehr schönen Ausblick. Der Gardasee ist nur 350m entfernt und zu Fuß zu erreichen. Es gibt auch eine eigene Garage für das Auto. Andrea (Vermiterin) ist super nett und man kannsie jeder Zeit anschreiben oder Anrufen, wenn etwas ist. Die Wohnung würde ich immer wieder Buchen. es freut mich, dass ihr euch so wohl gefühlt habt. Über ein Wiedersehen würde ich mich sehr freuen! Eine super schöne Wohnung mit einem sehr schönen Ausblick. Der Gardasee ist nur 350m entfernt und zu Fuß zu erreichen. Es gibt auch eine eigene Garage für das Auto. Andrea (Vermiterin) ist super nett und man kannsie jeder Zeit anschreiben oder Anrufen, wenn etwas ist. Die Wohnung würde ich immer wieder Buchen.